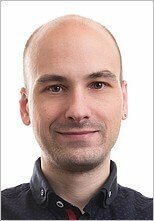 Best Vitamins for Thinning Hair, Hair Loss and Hair Growth? Most vitamins for thinning hair and hair loss that can help restore thicker hair growth should be available from a normal healthy diet. Problem is, not everyone has a healthy diet! So if you want to know which supplements to take and what foods to eat, this simple guide explains all. First of all, remember that the vitamins, minerals and other supplements listed below are no substitute for a decent diet. But, taken alongside the foods for vitamins and minerals explained in the sections below and in time* you might just find that they can improve hair health and contribute to hair regrowth by helping thinning hair thicken up and reducing your rate of hair loss. * It could take months before you start to see improvements. But, if you persevere and do eventually realize that your hair feels stronger, looks thicker and less hair is falling out, then you'll know that it was all worth the wait. And if patience is not your strong point, at least you'll be using what should be a totally safe, natural approach to tackle your hair loss. The vitamin B complex includes: B3, B5, B6, B12, folic acid, PABA, inositol, biotin, choline. Note: Not all B complex vitamins are listed here because not all are specifically associated with hair growth. But, as you can see from the list, many are. 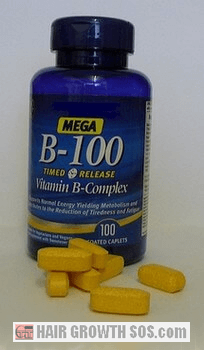 So it makes sense to find a good multi B complex formula (i.e., one containing all the B vitamins) rather than searching for several individual B vitamin products. As you can see, there's a lot of supplements you could take to try and help save your hair! 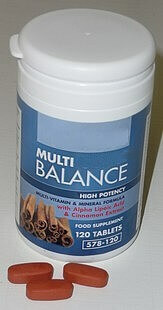 So, choosing a good multi formula is the easiest way to obtain all the vitamins and minerals listed above. And if the B vitamins they contain are at a decent dose, then you might not even need the vitamin B complex formula mentioned earlier. Many multi formulas also contain various other nutrients besides vitamins and minerals which might also promote hair regrowth (e.g., green tea extract). And some formulas will specifically target hair loss - many of these don't really contain anything different from a regular multi formula, but the dose you get from certain nutrients might be a lot higher (e.g., biotin and magnesium). Most people won’t be deficient in any of the vitamins and minerals listed above simply by following their normal daily diet. But, finding the optimum dose for hair regrowth using supplements is next to impossible. That's because the actual amount of each nutrient that you need is dependent upon many things: digestive system efficiency, nutrient utilization, age, lifestyle, etc. And clearly all these things will vary from person to person. Note: The RNI (Recommended Nutrient Intake) does give general guidelines for daily intake of vitamins and minerals. But these are often considered to be set too low. And it's for this reason that no RNI's have been given in this article. 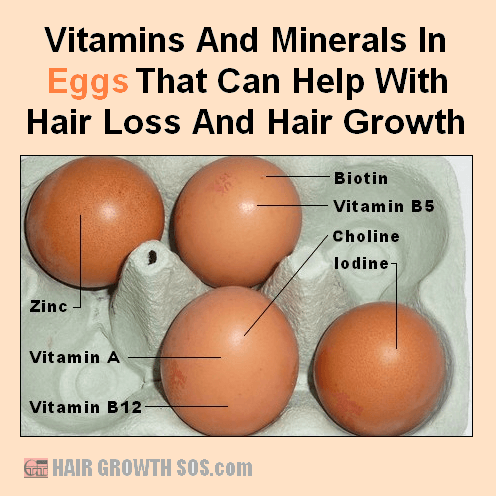 The list below gives natural food sources of all the vitamins for thinning hair and hair loss that can help hair growth from the previous section. Both animal and vegetarian sources have been provided wherever possible. Promotes healthy hair follicle cell growth, and prevents dry, brittle hair and rough skin. Natural sources: liver, oily fish, eggs. Vitamin A is also formed from beta-carotene (e.g., carrots). B3 (Niacin) - Can help increase scalp circulation. Natural sources: chicken, turkey, fish, wheat germ. B5 (Pantothenic acid) - Important for adrenal gland function and conversion of carbohydrates and fats into energy. Pantothenic acid is considered to be one of the best vitamins for thinning hair and hair loss. Natural sources: whole grains, liver, kidney, egg yolk. Vitamin B6 (pyridoxine) - B6 is good for maintaining hair color, and a deficiency can cause hair loss. Natural sources: wheat germ, yeast, soy. Vitamin B12 (cobalamin) - Essential for normal metabolic function of cells and nervous system. Hair loss and pernicious anemia could eventually result from a vitamin B12 deficiency. Natural sources: meat, fish, poultry, eggs. Folic Acid - Possibly the most important of all the vitamins for thinning hair, hair loss and preventing loss of hair color. It's also very important for women (especially if pregnant). Natural sources: chicken, nuts, soy and fortified breakfast cereals. Para-aminobenzoic acid (PABA) - Can help return hair to its original color. Natural sources: whole grains, yeast, kidney and (especially) liver. Biotin (vitamin H) - Biotin will help metabolize fatty acids and helps prevent premature graying. Natural sources: egg yolks, liver, milk, yeast and kidney. Inositol - A diet lacking inositol can cause skin irritation/eczema, nerve problems and even baldness. Inositol can help reduce cholesterol levels in the blood. Natural sources: soy lecithin*, wheat germ, barley and black-eye peas. Choline - Choline can help counteract stress (which can contribute to hair loss). Natural sources: soy lecithin*, egg yolk, yeast, liver and wheat germ. * Soy lecithin is added to many processed foods we eat. So it can be classed as a food source. However, higher doses are usually obtained by taken it as a food supplement (either in capsule form or as natural soy lecithin granules). The main reason why soy lecithin can benefit hair growth is by providing choline and inositol, both of which are lipotropic agents and emulsifiers: lipotropic agents have an affinity for fats, and help clear fat from the liver; emulsifiers break down a liquid into tiny droplets and disperse it (i.e., not dissolve it) in another liquid. So, basically, choline and inositol improve how your body deals with the fats you consume and, in so doing, might help combat hair loss and support hair growth. The importance of fats, both good and bad, are explored on this page. Note: Developing a choline or inositol deficiency is possible but can't cause the most common type of hair loss (androgenetic alopecia). However, inositol deficiency symptoms can include patchy hair loss. 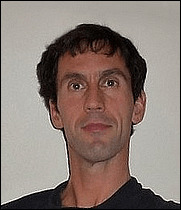 Choline deficiency symptoms do not include hair loss. This vital nutrient can assist some other vitamins and minerals (e.g., it helps iron absorption) and is essential for healthy skin, blood vessels and collagen formation. It's also a powerful antioxidant (antioxidants fight cell-damaging free radicals that cause your body to age). Natural sources: berries, citrus fruits and leafy green vegetables. Can help prevent gray hair and hair loss. This antioxidant vitamin also promotes healthy blood flow, which can help maintain strong scalp circulation. Natural sources: most vegetable oils, hazelnuts, almonds, soy. Helps metabolize iron and fat and is involved in pigment formation (so it may help prevent premature gray hair). Natural sources: liver, yeast, sunflower seeds and nuts. Used in thyroid hormones for controlling metabolic rate, growth, development and protein synthesis. A deficiency might slow down your metabolism with symptoms that include hair loss. Natural sources: oily fish, eggs, seaweed. Forms a component of hemoglobin within the red blood cells that transport oxygen throughout the body. An iron deficiency can cause anemia and hair loss. Natural sources: liver, kidneys, fortified breakfast cereals, black-strap molasses. Important for the nervous system, it relaxes muscles and may help reduces stress. Natural sources: halibut, nuts, soy, wheat bran. Helps the immune system and protein utilization. This antioxidant can also help counteract dandruff. Natural sources: Brazil nuts, kidney, oily fish. Needed for bones, nails, joints, hair and skin. Silica is said to help hair grow thicker, stronger and create more shine. Natural sources: leafy green vegetables, beets, parsnips, apples, grapes, raw almonds, oats. Sulfur improves the sheen and texture of hair, stimulates blood circulation, reduces inflammation, is important for collagen production, etc. Natural sources: garlic, onions and protein rich foods like meat, fish, poultry, liver, nuts. Vital for healthy skin and nails, improvement of the immune system, cell division, hormone balance, absorption of vitamins, protein synthesis, etc. Natural sources: wheat germ, pumpkin seeds, brewer's yeast, oysters, mussels, shrimps, egg yolk. Do It for Your Hair! As you can see from the two sections above, finding the right foods to obtain the vitamins and minerals your hair needs, is not that difficult. There are plenty of healthy choices you can make in preference to the junk that most people usually throw into their bodies. But, therein lies the problem - unfortunately, many people simply don’t seem to have the discipline to avoid the foods they know all too well are unhealthy. However, knowledge can be a very powerful tool. So, if your current diet is far from ideal, then perhaps now that you know which vitamins for thinning hair and hair regrowth you need (and which foods contain them), you’ll be able to make better choices from now on. Need to know which foods to avoid? It’s important to realize that, even if you do choose a healthy diet, you've got to do it right. If you overcook your food, you're not going to get as many (if any) vitamins into your body. That's because, if you cook your food at very high temperatures (by frying, grilling or baking) then you’ll not only end up burning it, but you can also destroy the vitamins it contains too. And whilst the minerals your food contains should still be fine at high temperatures, it's still far better to cook at lower temperatures (by gently steaming or boiling) so you get as many nutrients from your food as you possibly can. If you consume too many vitamins for thinning hair and hair loss disorders you might actually harm your hair. An excess of vitamin C can cause the skin cells in your scalp to divide too quickly which can then lead to a flaky scalp (which is unnatural and clearly something that won't help your hair grow). Vitamin A can also speed up cell division in hair follicles, making your hair grow faster. And whilst that might sound good at first, your hair might reach the end of its natural growing phase more quickly than it should, and then fall out prematurely. Vitamins A, D and E are fat soluble which means they can all be stored by your body. And, in time, any excess accumulation that occurs could cause side effects. An excess of vitamin A, for example, can cause hair loss and weight loss. Of course, if you obtain all your vitamins and minerals from the foods you eat, you're far less likely to overdose than if you take supplements - managing to eat so much of something every single day that your vitamin or mineral levels eventually become excessive, is difficult! But taking a few pills on a daily basis is easy. However, the risk of overdose should only really be high with fat soluble vitamins (as explained above), whereas water soluble vitamins can be excreted in your urine if you consume more than your body needs. I believe that no matter how many vitamins, minerals and other supplements you take for your hair, there's no way they can stimulate hair regrowth on their own. 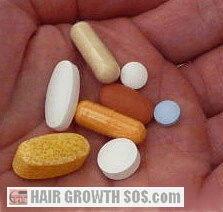 I do think that taking certain vitamins for promoting hair growth can help, but a hands-on approach to hair loss will far exceed any nutritional supplement you take. That's because, after several years of suffering hair loss myself, I developed my own hair regrowth techniques which produced amazing results for both myself and many other men and women. My methods are based on the research I did into skull expansion - the real reason behind hair loss. You can learn about my techniques form this ebook. Note: Before taking any vitamins for thinning hair or hair loss, it's best to consult with a doctor to confirm exactly which condition you have. And blood tests can reveal certain vitamin and mineral deficiencies.